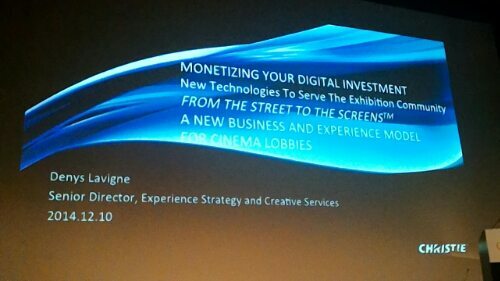 Cinemas have been digitized, but for new cinemas that were not covered by VPF there is still a need to make money off digital and the pre-show. That was the topic of the second session of the second day of CineAsia, introdiced by Mark Shaw from Shaw Theatres. The talks were short and because the previous Christie session over-ran, everyone on stage talked extra fast. Todd Hoddick, VP Global Entertainment Barco – “You are going to see a lot of great ideas today,” he promised. “All about the ideas you see there are two things – we must improve the audience’s experience, give them an adventure and romance, something they can’t get at home. Secondly, drive revenue. These things will not be driven by VPF. With that, lets start the presentation,” Todd announces. “In mature markets we see very flat growth, maybe at most one per cent. Whereas in China we see tremendous growth. 14 screens per day in China,” Todd points out are opening. Micro-trends: “No more VPF happening; exhibitors have under-utilized places – competing with the likes of Netflix we need to differentiate. These products have to be profitable. They will not be subsidized by anyone else,” Todd re-itterates, in case there is anyone who still believes in Santa Clause the Easter Bunny the Tooth Fairy Second Round VPFs. 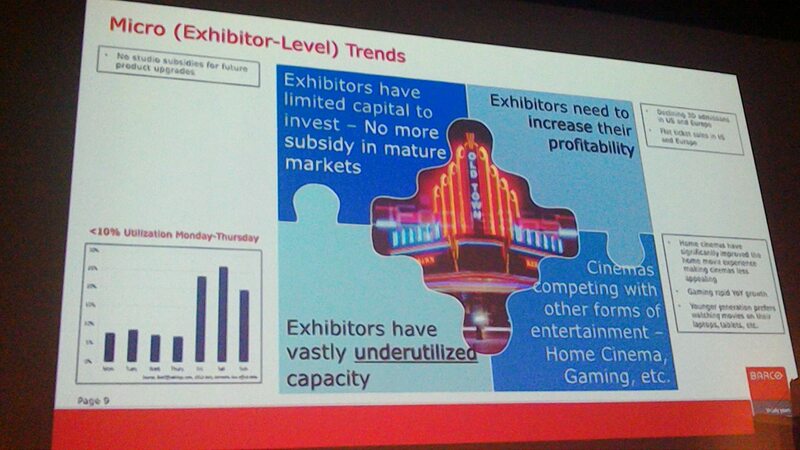 Barco’s digital cinema priorities are: enhacing audience experience & be profitable for cinemas, Todd emphasises again. “Thank you for making Barco the global number one digital cinema company and number one in China. We are listening,” was his final point. “I will tell you a small story before we start. Eight years ago I spoke on stage in Beijing about the future of 3D. The Culture Minister with me on stage saw the vision and next three years there was big uptake of 3D in China. That is the way I feel right now,” is how Ami opens his presentation. (Makes everybody stand up.) “We have tiny camera in the theatre. We know when you talk to a friend, we know when you take out your phone. We know everything. I have three kids, they all have mobile phones. They want to ouch the screne. That is what AE allows.” [He says this wihout making it sound too much like 1984] Ami also agrees with Todd that it needs to make money. He goes on. “We know how many people are smiling, how many are laughing, how many are crying. We will not develop the solutions you need; YOU will develop the solution you need. That is why we have made SDK available.” [OK, now it sounds a bit more 1984] (runs iD movie). “The Barco logo is there for a good reason: they are a major shareholder,” Ami aknowledges. Talks about the difference between passive and active interactivity. “The former is syncing your mobile phone to the big screen. But active interactivity allows us to control what is happening on the big screen.” He stresses that AE has been around for a long time in concerts and Time Square. “But now that cinemas are digital it opens up opportunities.” He then states “You will remember the one presentation that made you stand up and sit down. That is why advertisers are prepared to pay four times more. Go to advertisers and show them what is possible now. If they want results, point them to our website. There is all the data there.” More tomorrow (Thursday) morning is promised. “We don’t have a lot of time, so I will try to do it quickly. I agree with Todd and Ami that this is about bringing new innovation to cinema. Imgine how engaged your audiences will be if they could interct with the big screen. 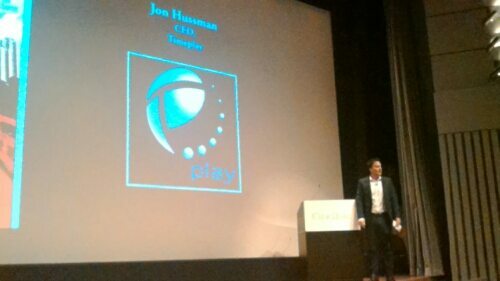 Everyone has a mobile phone so that is what we are focused on,” is how Jon opens his presentation. TimePlay currently operates in over 700 cinma screens before every movie, he shares. “There are 1.76bn martphones world wide; 66% mobile phones in China are smartphones. – it is all about mobile. It is becoming part of the fabric of everyday life. We turn your phone into a controller.” He says theirs is the only system where the audience controls what is on the screen. Results: “Consumers love it. We have a cult following. People perceive it as entertainment. Partners selling for 100-200% more than linear [adverts]. 6 million downloads per 1,000 screens. 52% voluntary email sign up rate,” are some of the stats that Jon shares. Usage – 850 screens. Cinema average 27%, smartphone 36%. Usage: Frquent moviegoers: 42%, smartphones 56%. Benefit: this drives loyalty, incremental revenue, payback is less than a year, e-comerce opportunities, driving exhibitor app downloads. “To screen advertisers it is the holy grail,” Jon claims. Additional ad inventory, premium media rates, higher CPM earlier in pre-show, new revenue stream through Mystuff revenue per action, more tools to attract broader scope. This puts consumerdata in the hands of exhibitors and advertisers, he observes. Skinnable template. Engagement, amplification, dpath to purchase – it’s what it is all about. Trailers: “we’ve done a bunch of stuff with studios.” “Star Trek: Into Darkness” flashes up on a poster. Using it for business meetings is another potential this has – Microsoft is already the first client. Paying between $5,000 and $10,000 per event.Movie goers, exhibitors, audience and advertisers. Studios – Star Trek into Darkness. 20% redemption for buying DVDs. Redemption and activation averaging 35%, sometimes as high as 53%. 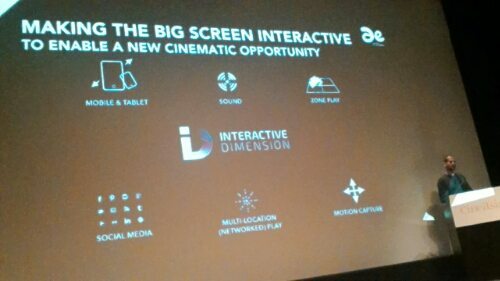 “This is the next big thing in digital cinema – interactive cinema. This will let you engage, entretain, inform and earn. Demo at 5:15pm,” Jon concludes. “The lobby has historically not been used to its greatest potential. We are now at a point when the lobby needs more love. We are doing a lot of things at Christie to fascilitate that,” is Dennis’ opening statement. Dennis founded the experiential digital signage company that was acquired by Christie last year. Had colaborated with Christie a lot over past 5-6 years. Experiental is happening in a lot of environemnts – stadiums and airports – but not cinema. The agencies are looking for new channels to showcase their brands and connect with audiences. Guzzo Cinemas in Montreal, Dolby Theatre Barcelona. Moscow Cinema [I missed the name]. Christie Experiential Network – Introduced in North America in Oct 2014. 1st location opening in Detroit in two weeks. Dec 18. Christie invests in the technology. “Business model is revenue share. Christie will sell advertising through its own agency to brands, agencies and studios. Expansion into Asia in the coming months,” Dennis promises. New layer in the Christie business offering. (Plays intoduction ‘From the Street to the Screens’). Moe loyalty, have people come more often. And with that this session ends.